Warning: Meat fest!! Great for frying or BBQ the Paleo Pig Burger was a hit. My little guy calls it his "Booger"! He had two helpings! Pretty yummy and I had enough to freeze for later! Remember to use clean meats! We drive miles to get the best meat from a trusted farmer and the movement is growing! 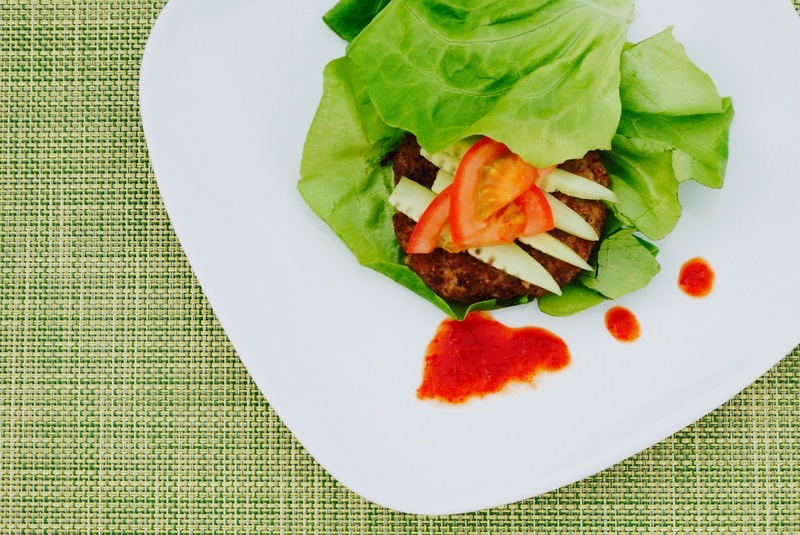 We paired the burger with PaleoChef Sriracha for the adults because the sweetness of the pork matches up with the sweetness of the Sriracha nicely. In a bowl whisk the eggs and add all remaining ingredients (but Ghee) kneading it with your hands until well combined. Form the meat into flat patties and place them in a cookie sheet lined with parchment paper. Add the ghee to a skillet, fry the burgers until throughly cooked (approximately 3 minutes on each side). Or you can just put it on the grill! Serve them wrapped in lettuce or use our Dollop Rolls as buns! Feel free to add fermented pickles, tomatoes and onions as well!